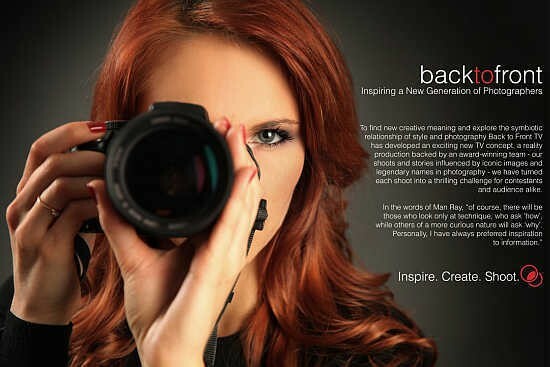 Back to Front TV has just announced a new reality show for style photography. The 9-episode series will take the form of a progressive elimination show that will "celebrate the essential relationship between style and photography," Back to Front TV said in a statement. Casting for the series will be conducted through a call for contestants, inviting anyone with a keen interest in photography to submit their best image and describe their motivation for participating in this exclusive first series. The show will break down the process with a mentor briefing and tasks being set for the contestants, who will need to prove their talent on real-life photo shoots. After the photo sessions, there will be a blind-judging process by which the contestant photographer's work is selected or rejected. For more information, contact the company via the address below. LONDON, United Kingdom, September 25 -- A new reality show for style photography is announced today by Back to Front TV - a creative first for Britain the global capital of fashion, and therefore, of fashion photography. The 9-episode series developed by Back to Front TV will take the form of a progressive elimination show that will celebrate the essential relationship between style and photography. Casting for the series will be conducted through a call for contestants, inviting anyone with a keen interest in photography to submit their best image and describe their motivation for participating in this exclusive first series. The idea for the series came from a meeting with a legendary photographer, whose work has a special creative meaning in the world of fashion. "The entertainment platform is already established - at the intersect between still and moving images" explained Haider Mannan, creator of the concept and principal of Back to Front TV. "We would like to create something special and there is unprecedented demand for original unscripted TV content. The audience is the photographer inside all of us and this will enable the world to watch as our real-life photographers reveal if 'great photographers are born, or made'." The show will break down the process with a mentor briefing and tasks being set for the contestants - managing their own shoot against a deadline - the contestants will entertain from behind the camera on real-life photo shoots. Each shoot will be a thrilling challenge for contestant and audience alike and there is a blind-judging process by which the contestant photographer's work is selected or rejected. "Style photography is an art form – one that has given us countless iconic images – providing both a reflection of our culture and times, and a demonstration of how to be successful," explained Peter Bonisch, commercial director of Back to Front TV. "This program represents the first step for us in this space, hence the working title for the series, and we are very excited to help realise it for the UK viewing audience." The show will be executive produced by Back to Front TV, a firm that develops content among other production related activities; and is advised by Mannan Capital Partners. Back to Front TV develops innovative original entertainment properties for production and distribution across all forms of media, traditional and emerging. Using a hybrid approach, concepts are developed in close partnership with a creative collaborative before commercial validation. Back to Front TV is a company of Mannan Capital Partners. Mannan Capital Partners is an early-stage heavy lift partner for projects in the emerging technology and media space. The firm follows a strict philosophy in bringing together investors and sponsors onto a single platform to support capitalisation and development of entrepreneurial ideas.